Age and sun damage diminish the body’s ability to replenish and maintain youthful levels of Hyaluronic Acid (HA) in the skin, leading to loss of volume and visible signs of aging. 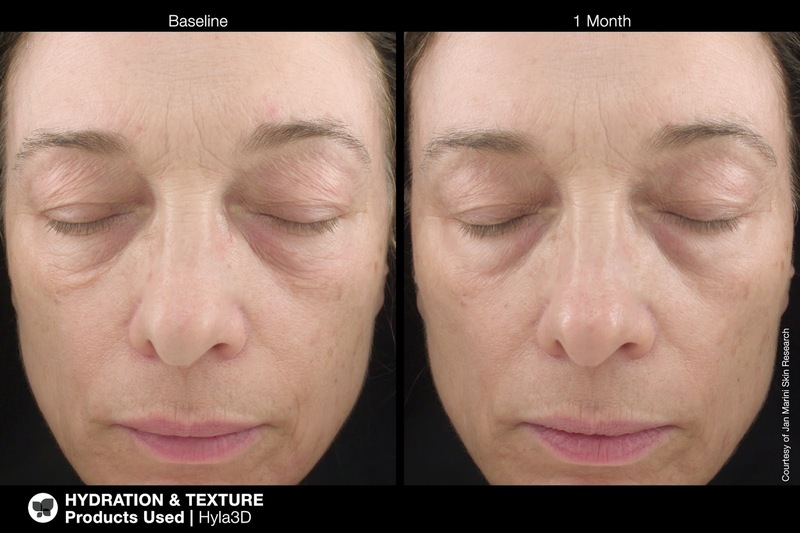 Hyla3D takes a 3-dimensional approach to restore skin’s hydration, youthful volume, smoothness, and to reduce the appearance of fine lines and wrinkles. HA is a major component for overall healthy skin that has youthful volume and hydration. Numerous key ingredients in Hyla3D work in 3 modes to address the needs of healthy, hydrated and rejuvenated skin. 1) Multiple molecular weights and forms of HA result in deep penetration and rapid, long-lasting, continual hydration. 2) Advanced technologies enhance native HA within the skin. 3) Peptides and antioxidants boost collagen and elastin. 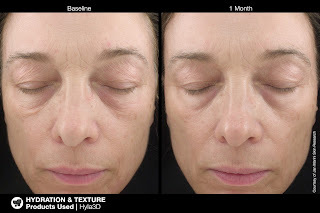 As a result, Hyla3D restores hydration and 3-dimensional volume, while reducing the appearance of fine lines and wrinkles for a more youthful, contoured look. This product is one of the better products I have used for anti-aging. Hyla 3D actually works in the skin to change the way hyaluronic acid is produced so that lines and wrinkles are not produced, they are actually eliminated and they do not form again. Hyaluronic acid is one of those molecules that forms in the body and dissipates over time as we age. We need it to be replenished. Hyla 3D replenishes Hyaluronic Acid and helps the skin to produce new Hyaluronic Acid so that skin stays hydrated and moisturized. It also contains peptides and antioxidants that help to boost collagen and elastin production in the skin which is also essential to anti-aging and reducing the look of lines and wrinkles. I used this for several weeks and noticed that my skin felt smoother, looked and felt firmer, had an overall tighter appearance, lines looked like they had disappeared and my skin was definitely more hydrated. Shake well before using. Prior to use, leave plastic lid in place, invert and tap the top of the container several times into the palm of your hand. If you experience difficulty when dispensing, repeat and pump product into the hand while inverted. Apply sparingly in the morning and evening over entire face and neck.Use Hyla3D as part of your current skin care routine, immediately before applying your moisturizer. Hyla 3D is available on www.janmarini.com. Lika JMSR on Facebook: https://www.facebook.com/JanMariniSkinResearch; Follow JMSR on Twitter:@JanMarini; Follow JMSR on Instagram:https://www.instagram.com/janmariniskinresearch/; Follow JMSR on Google+:https://plus.google.com/+janmarini and Follow JMSR on Pinterest:https://www.pinterest.com/myjanmarini/.